Formed by brothers Alessio (guitar) and Vincenzo (bass) Sanniti in Latina (Lazio, Italy) in early 1998, Misantropus is an environmentally-conscious doom metal band whose latest release, "The Gnomes" is dedicated to the four natural elements and to the entities that represent them. As this veteran green metal band all but specializes in classic Italian-style doom (with the legendary Paul Chain a longstanding source of inspiration) they are suitably enough now signed to Minotauro Records. And in standing with much of the group's back catalog, "The Gnomes" is a instrumental release. A HEAVY and DARK instrumental release, but a instrumental release all the same. Just so you know what you're getting into. On "The Gnomes" drum duties fell to Alessio Sanniti with guest Mario "The Black" Di Donato helping out as a second guitarist. Otherwise what you see is what you get. As for my favorite moment? That would be the last of the four numbers here, Elfs ( Raphael). It falls somewhere between Paul Chain, a stream-lined Saint Vitus and one of my all-time favorite soundtrack bands, Goblin. Without a doubt it's super effective and it had me hitting the replay button a few times over! 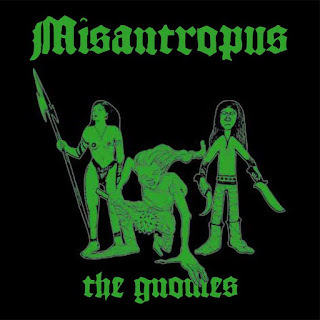 Recommend for fans of Paul Chain, Saint Vitus and Manilla Road, "The Gnomes" is another great addition to any doom collection and another reason why I look forward to each new Minotauro Records' release!